The number of times Bram Stoker’s novel ended up as a film continues to grow. In 2012 Italian horror-maestro Dario Argento will unveil his own version, this time in 3D. Not surprisingly, fans are already debating it. Which in turns leads to discussions (arguments) about all the different Draculas out there. Charles E. Butler even wrote a book, “The Romance of Dracula” contrasting all the attempts to make the novel into a film. For starters, is the book romantic? Our culture nearly always looks for some kind of love story in any dramatized work, so much so that when one is cut from a story we immediately ask why. In “Dracula” we have two main love stories. Jonathan and Mina Harker seem like a loving, middle class couple who share a terrible experience first separately then together. We’re told in the end they have a son. Mina’s best friend Lucy meanwhile has three different suitors, and in the end she chooses the most socially prestigious of the three–Arthur Holmwood, later Lord Godalming (presumably either a baron or a viscount). When she becomes the vampire’s victim all three suitors agree to hunt down the creature that destroyed her. Notice what both these stories have in common? Neither involves Dracula himself. But look at the films! 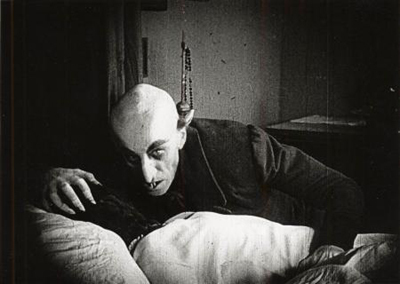 Even as far back as the silent “Nosferatu” screenwriter and director sought to make a stronger connection between the vampire and his victim. By the time we get to the Palance version, such becomes a motive for much of what Dracula does in the entire story! But why? The reason becomes clearer when you ask–who is the Protagonist? In literary terms this would be THE good guy, the one against whom the Antagonist strives. Or, to put it another way, who is the Hero? Reading the book for the very first time, one can be forgiven for presuming Jonathan Harker to be the hero. We meet him first. He initially meets the villain of the piece. For chapter after chapter after chapter we see the unfolding tale from Harker’s point of view. But then he disappears from the narrative for even longer. Doesn’t seem like the protagonist at all, especially since upon returning he doesn’t take the lead in tracking down the Count. That would appear to be Van Helsing, but he doesn’t make an appearance for over a third of the way through the story (in Francis Ford Coppola’s film they cheat by making him a narrator as well as hinting at a deeper connection between Dracula and Van Helsing in the prologue–ever notice the actor playing the priest?). In fact, what Stoker did was use an ensemble as the protagonist–and ensemble of six people. And it didn’t help that so many of them are lackluster. The dramatic instinct is for introducing the protagonist almost at once. James Bond, Sherlock Holmes, Zorro, Doctor Who, Buffy–we meet them almost instantly in any particular tale. On some level therefore it feels as if Dracula himself were the protagonist. But he’s the bad guy! So the trend developed to make him into a kind of anti-hero, which had the added bonus of giving the audience conflicted feelings. Conflict is drama, and for it that conflict to bleed over into the audience is actually ideal! Unfortunately, that tack seems to have pretty much run its course. Indeed, one of the most refreshing things about the Marc Warren/David Suchet “Dracula” in 2006 was the straightforward evil of the title character! No tragic Faustian figure here! Rather, a charming but ruthless and cruel appetite. Actually, that version also highlights the point made earlier. In fact, it remains one of the weakest parts of the whole book. Quite simply, in general the baddiess are more interesting that the goodies. Dracula and his brides, plus the wonderful character of Renfield (who is to Stoker’s work what Gollum is to “Lord of the Rings”). No coincidence that in numerous adaptations one way to make Harker more compelling is to turn him into Renfield! The Lugosi film did it. So did the 1967 televison version with Dernholm Elliott. Yes, that streamlines a dense narrative but also it gives nuance and detail to an otherwise very boring clerk. Coppola tried to create in Harker and Mina a great love story, failing mostly because Keanu Reeves is a born character actor rather than a leading man (he unfortunately looks like a leading man). The 2006 television version deserves kudos for trying to make Arthur Holmwood a rich character in his own right, creating a new and intensely tragic subplot around that character (while eliminating Renfield altogether). Just as it is little wonder Dr. Seward, another fairly dull individual, gets transmorgrified into Lucy’s father as often as not. Quincy generally gets cut altogether. And in the Lugosi as well as Langella films, if the so-called Romantic leading man were Holmwood instead of Harker, how could you tell? How could anyone without actually being told? Would it result in any changes? Not that improving the dull characters is a bad idea! But the temptation to do the same to the title character tends to overwhelm everyone else! Dracula himself is hardly ever ‘on stage’ in the book. In this at least Hammer Studios was at least on the right track. In Christopher Lee they found an actor who barely needed lines to dominate a film (this same quality served him well years later in “The Two Towers”) and one suspects that is a wise direction with which to handle the character. In my view the 2006 BBC version is terribly underrated. I much prefer it to Coppola’s, which is fatally flawed by Dracula’s undeserved divine redemption. Not to mention the wholly unnecessary reincarnated love motivation done before – and far more logically – with The Mummy (1932) and She (1935). Marc Warren’s performance is among the best Draculas. Some criticize ’06 for not being faithful to the novel, but it’s no less so than the 1958 Hammer classic. My favorite version, though, is Herzog’s Nosferatu. Even a lot of vampire movies that are not adaptations of Dracula are essentially retellings of Dracula, from Salem’s Lot to Habit to Vampyros Lesbos. Kind of like how a lot of zombie movies (and more and more vampire movies – fittingly, since I Am Legend is a vampire story) are essentially retellings of I Am Legend. Dracula has always been the story’s protagonist. Johnathan Harker and Dr. Van Helsing are the “heroes”, but Count Dracula is the central character. Dracula initiates actions, then the other characters react to him. Calling Harker and Van Helsing the protagonists would be like saying Luke Skywalker and Han Solo were the protagonists of “Star Wars”. The story of “Star Wars” is the story of its protagonist Anakin Skywalker/Darth Vader, and how his actions led to the rise and fall of the Sith/Galactic Empire. Again, Luke and Han reacted to what Anakin/Vader initiated. This may be my being picky, but in fact the protagonist is not necessarily the most active character, nor even the catalyst for action. By that standard, Buffalo Bill is the protagonist for SILENCE OF THE LAMBS. Dracula is the antagonist precisely because his actions put him in direct conflict with the “hero” i.e. the one(s) with whom we are supposed to identify. Me I quite liked BRAM STOKER’S DRACULA but feel it has took the “reincarnated love” idea as far as one can go for a long time. the “hero” … with whom we are supposed to identify. Therein lies the rub: What if the reader sympathizes/identifies with the “villain” more than the “hero”? Even as a child, I thought Johnathan Harker was milquetoast and the Count was badass! And who didn’t root for Anakin/Vader to be redeemed by his son Luke? Many of the beta readers of my novel feel my intended “villain” is the protagonist. They identify with a skirt-chasing vampire who loves/hates the wife he’s been cheating on for over two hundred years more than they do my upstanding “hero” vampire (who wants to redeem this perpetual “bad boy”). I should have seen this coming. After all, would anyone say Luke is cooler than Darth Vader? John Harker cooler than Dracula? Hell, no. People love anti-heroes, and the vampire is (or should be) the ultimate “bad-boy/bad girl”. I have read the book five times and seen most of the films and as far as I am concerned, althought all the films are good, none of them trully do the book justice. Copolla swore up and down that his version was the most faithful. Even though he was the first to incorporate most of the characters, including Quincey Morris who is for some reason always left out, Dracula is not a love story. Atleast not one between Mina and Dracula. Now that must have had Stoker spinning in his grave. I think one of the real problems with Dracula is that most people have a misconception about what he looks like. I mean everyone thinks he looks like Bela Lugosi, right? WRONG. Read the book, Stoker describes what Dracula looks like in detail, and that is what I am hoping this new version of Dracula will bring to the screen.